Catherine O. 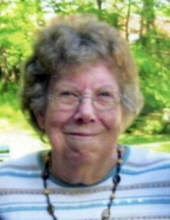 West (nee Drew), a longtime resident of Monroe Township, passed away February 5, 2019 at the age of 89. Catherine was the loving wife of the late Robert A. West, beloved mother of Sam Snider, Karen Schuster (John), Russell Snider, Edith Van Der Velde (Bill), David West (Margaret) and Rhonda Tapia (Ben), devoted grandmother of Danielle, William, Katie, Sarah and John and 19 great-grandhildren, dear sister of John Drew (Sylvia). Catherine deeply loved her family and also cherished her garden and her birds. Visitation will be held Friday, February 8 from 1 PM until the time of funeral service at 2 PM at E.C. Nurre Funeral Home, 177 W. Main St., Amelia. Interment to follow at Monroe Presbyterian Cemetery. Memorial contributions may be made to Hospice of Cincinnati. "Email Address" would like to share the life celebration of Catherine O. West. Click on the "link" to go to share a favorite memory or leave a condolence message for the family.